At the risk of sounding like some been there, done that, got the t-shirt, wrote the book, waiting to star in the movie type, I have to say that the most interesting aspect of the fifth Costello and The Imposters concert I've caught since early December came before and after the actual concert. That says more about Hughesy and the circumstances in which I live than it does about Costello but it says a fair bit about the man as well as quite a lot about the way popular music has morphed over the past fifty years. All of which is interesting, at least from where I'm sitting. Actually, sitting is a key factor in the experience this time around, since Elvis had a significant section of the crowd up, out of their seats and down in front of the stage very early in the piece. It was fairly obvious he was playing to, and feeding off the enthusiasm of, those right under his nose, which might affect your perception if you were one of those disinclined to stand who happened to have a seat towards the front of the stalls. That was me, more or less, but the occupants of the seats at the end of Row L had headed for the front so it was easy enough to move to the side for an uninterrupted view of proceedings. But you pays your money and you takes your chance, as the saying goes, and while what you'll get isn't always totally, like stellar, man, you won't get a performance that's phoned in, either. It all comes down to the interaction between expectation and on the night, doesn't it? Cast an eye down the set list and you'll note a significant (five out of twenty-five) presence of Wise Up Ghost material, which might interact with some of those absences noted previously, but it is the current album, even if it isn't the current album by this band. What is interesting, as it has been since the first of the Spinning Songbook shows in Japan is how well those songs work with The Imposters rather than The Roots. Despite the fuss about Wise Up Ghost it wasn't quite the departure from previous form that some people painted it to be. I'll point The Dubious Reader towards When I Was Cruel and Cruel Smile and rest my case. No, a good two hours, an interesting set list that didn't seem to hold too many surprises and a performance that was as committed as he almost invariably is. That almost invariably is based on eight experiences, none of which went anywhere near obviously phoned in. And you expect a bit of variation when you're looking at an act that isn't pre-programmed. 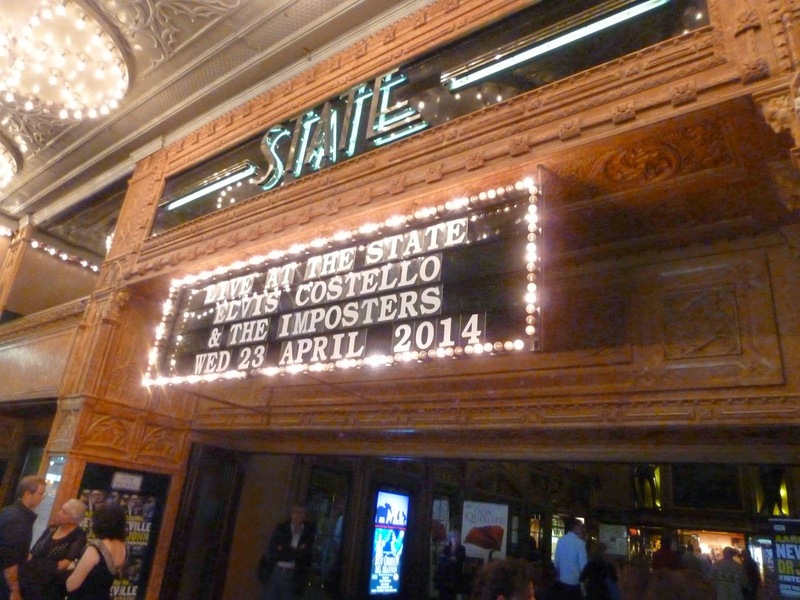 Compare a Costello show, any Costello show, to, say Leonard Cohen, who I've seen deliver close to the exact same show live (three years apart, and substantially the same as the Live in London DVD) and you know you're going to get variation. The question is how much is delivered, and how much you expect. Consulting my Costello show song matrix (eight shows, 116 items) there were a couple of songs I hadn't encountered live before (Watch Your Step, Stations of the Cross, Blame it On Cain) as well as the heartfelt Jesse Winchester tribute (Quiet About It, Payday) and another seven that I'd only encountered twice, so I walked out a very contented punter, thank you very much. But when it comes to looking back on the evening the rendezvous with The Pope of Pop and the early-twenties Popelet Twins will figure large in the memories. I've run across Popey before each of the three shows I've caught in Sydney, and a couple of pre-show beers at The Marble Bar isn't quite a ritual but could definitely head that way. They've changed the backstage access arrangements at the State Theatre, which has effectively put the kibosh on Costello stalking activities and affected the post-show discussion, but what we had, with Hughesy, Popey and Papal offspring gathered around a table in what my learned colleague has described as sort of like the Vatican in pub form was an interesting mix of musical generations. I go back to the halcyon days of the mid- to late-sixties. Popey doesn't quite go back that far but had older siblings with similar musical interests who did (from what I can gather) and seems to have been fairly thorough in giving his offspring an interesting musical experience along the way. They were eight or nine when they got their first dose of live Elvis, and obviously don't mind fronting up for more. I don't get to hang out with too many folks with similar musical interests, and when I do they tend to be people from more or less the same generation, so the presence of a couple of well-informed and appreciative youngsters is bound to be something memorable. Particularly if they're sufficiently well-informed (or polite enough, take your pick) to agree that an Easybeats/Purple Hearts tour of North Queensland would have been an interesting experience and one you'd regret having missed. It contrasted nicely with the demographic profile at the Dr John/Aaron Neville show the following night, where a youngish couple who might have been in their mid-twenties walking down the aisle towards their seats would have reduced the average age in the audience by about half a day. All of which explains that first paragraph, dunnit?